Protests in Brazil, Egypt, and Turkey: The wave of massive uprisings requires more than massive street rallies. In Brazil, Egypt, and Turkey, it will be much harder to turn those marches and rallies into genuine change. A man demonstrates against Brazil’s President Dilma Rousseff. How much can street protests do? 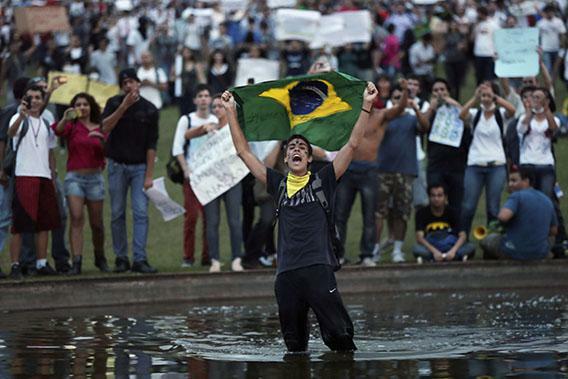 LONDON—In Brazil, the protesters wore halter tops and shorts. In Egypt, they wore headscarves and long sleeves. In Turkey, they wore more of the former, some of the latter, and quite a bit of face paint as well. In each of these three places they looked different, used different slogans, spoke different languages. And yet the parallels among these three protest movements on three different continents in three countries run by democratically elected leaders are striking, not least for what they reveal about the nature of the modern street protest. In Istanbul, Rio, and Cairo, the crowds had legitimate complaints about their respective democracies. Protesters shouted, among other things, about corruption in Brazil; creeping authoritarianism in Turkey; economic incompetence in Egypt. Economic slowdown was the background to protest in all three countries, but even so, the scale of the demonstrations was a surprise. Everywhere, the numbers were bigger and younger than anyone expected. As we’ve all been told many times, these things are easier than ever to organize. The combination of Twitter, Facebook, as well as the more old-fashioned medium of television can help get people out on the street. If you’ve seen it already in a photograph or on a video clip, then you know how to create provocative posters, wear costumes and masks, organize bits of street theater, and create chants and songs. Heavy-handed policing in several cases helped bring people out as well: Tear gas surely creates as many street revolutionaries as it discourages. But if it’s easier than ever to get people on the street, it’s still very hard to get people to follow up with necessary organizational work. As we’ve all learned in recent years, a flash mob created with the help of the Internet is not necessarily well equipped to make big institutional changes. Social media is not the same thing as social activism. The courage and dedication it takes to transform a society is not the same thing as the impulse it takes to join a crowd. “Just showing up” at the demonstration or the march can help create a day’s headline but nothing more. Real change requires the founding of institutions, of political parties, of news organizations, of local and neighborhood associations, of economic clubs and discussion groups that think about the interests of the nation, not of a single group or faction. In the end, the ultimate success of a street protest in a democracy depends on the degree to which its members are willing to turn their protest into real activism, to enter into their respective nations’ political systems, to work within the law, and to transform passion and anger into institutional and finally political change. In Egypt, whose new democracy was by far the most fragile of the three, the protests have in this sense already failed. Egypt’s anti-Morsi activists had not yet organized themselves into a coherent political party, they hadn’t created a political program with mass appeal, and they didn’t have an alternative elite prepared to carry it out. Without these things, their influence over the course of events was necessarily going to be limited. Knowing that they might well lose a new election, they called for the help of the army, and thus threw Egypt’s entire democratic project into jeopardy. In Brazil, by far the strongest of the three democracies, the protests seem to have already succeeded, at least in this narrow sense: Brazilian President Dilma Rousseff was forced to appear on television and to declare, “I hear you,” and she has called for a plebiscite on political reform. More lasting change in Brazil will require the crowds of young people to create an alternative political party to the one Rousseff leads, to put aside their dislike of the corrupt political establishment and learn how to join it, to renew it, to clean it up, to change its habits. If anything, young Turks in Istanbul face an even more difficult challenge: how to craft a political message that will appeal not just to the secular and the well-educated but to the mass of voters who brought Prime Minister Recep Erdoğan and his Justice and Development Party to power in the first place, and who might well do so again. But the first step to creating such an alternative is to understand that it’s necessary to do so. It’s fine to have disgust for politicians in a democracy, as long as you’re willing to become one, yourself—and it’s excellent to dislike establishment political parties, as long as you are willing and able to build your own in their place.